Time to pack the bags and head for Portland, home of lots and lots of beer. But not before a quick visit to the Rogue Ale House on Pier 39. 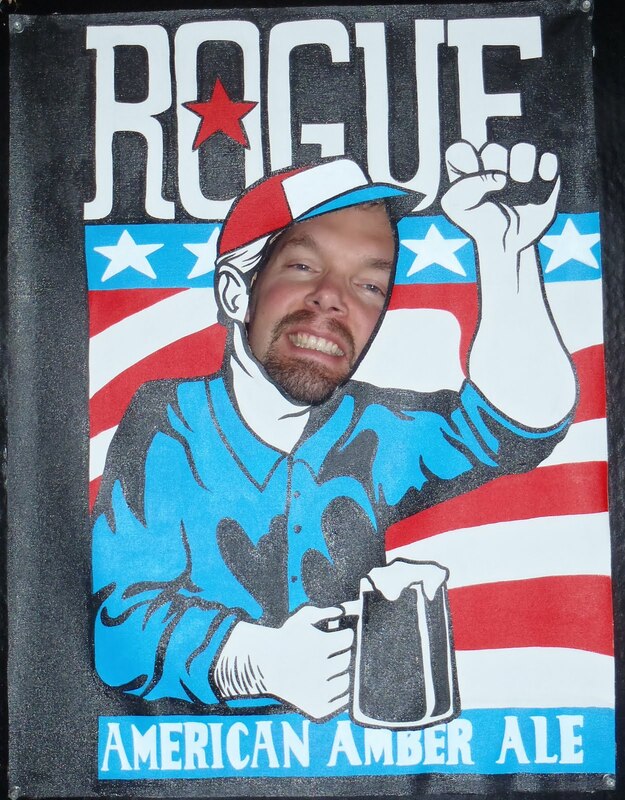 I was really looking forward to visiting this pub; Rogue brews has always beer solid and sometimes innovative. It all seemed good at the start. A nice gentleman brought me a beer to sample as I sat down. It was a guest tap: Buckman Black Saison. The Buckman was very good with ample ash, spicy yeasts and tastings of milk chocolate and vanilla mocha coffee. Your selection of beer samples were listed on blackboards located in various locations around the pub. After listing you choices, which was around 12 beers, on a simple form your sampler tray arrived. 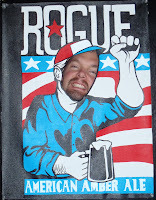 Don't get me wrong, I like Rogue beers, but their public house just seemed a little ... flat. The menu looked above average but not exceptional. There was no brewing on premises, at least not that I could see, just a lot of kegs. There were also lots of Rogue product (ie. bottles and T-shirts) lying around waiting for you to pick them up. Yes, yes I know the point of a pub is to sell beer, but you don't have to be overly invasive about it. And no I do not wish to join the Rogue Nation. Perhaps my feelings were tainted by the awesome beers at Fort George Brewery we had the night before. After the Rogue let down we headed towards Portland to prepare ourselves for Oregon Brewers Fest. After a quick visit with US border guards, it was on the road to Astoria, Oregon. There was a brief stop at my top-secret Haggen grocery store in Ferndale for some great craft beer. Ummm I guess it is not a secret anymore; at least I didn't tell you it was off exit 262. For those who have never been to Astoria, this place is cute. I'm not an expert on architecture, but the downtown core was built in the 1920's. It has the certain look; American colonial? Anyways... very nice, but we were here for the beer. First stop: Fort George Brewery. There were 10 beers on tap (2 seasonals), a wasabi ginger ale and two guest taps. This a lot to review in beer prick style, so I shall say all the beers were either good or stellar. Of particular note was the Spruce Budd ale. "We get a lot of bad reviews on this beer. People just don't get it", brewer Chris Nemlowill laments. It's an unhopped beer with only the spruce used for bittering. The nose is very floral with lavender, dry mustard and violet candies from Harrods. Many judge a brewery by its IPA; the Vortex was impressive. At 97 IBUs, this dark amber brew delivered every PNW hop flavour in abundance. One of their guest taps was Armored Fist by Boneyard Brewing. This collaboration with Three Floyds was the best Cascadian dark ale I have ever tasted. All flavours and aromas were massive: grapefruit, floral, roast, bittersweet chocolate and pine-sol. Next stop was the Astoria Brewing company at the Wet Dog Cafe. The first warning sign w as the lack of people in the place. After being told that we could sit wherever we wanted, the staff asked us to sit at the bar. So we politely moved from the beautiful view of the water to a view of whining wanna-be hipsters. Things went from bad to worse; every beer was either unremarkable or bad. Their 'Kolsch' style tasted like a cob salad and the Belgian style reminded me of apricot vomit. As the father of a vegetarian baby I know what apricot vomit smells like. The porter was nice, dry with ash and roasted coffee. It is really hard to @#$% up a porter; roasted flavours hide a multitude of sins. We left most of the beer on the bar and returned to Fort George. I have to cull some of the beer in my fridge. There will be many more new arrivals after I return from the Oregon brewers festival next week. Must make room for more. In case anyone is wondering, this was left in the fridge by my father. If has been a really long time since I ripped apart a beer, so sorry Mr Keith, your time is up. The nose is just stale roasted peanuts, maybe a bit of waxy chocolate and cheap canned fruit salad. There is too much fizz and slickness in the mouthfeel to be pleasant. It just coats everything and will not scrub off. If you have tasted one Keiths beer you have tasted them all. This swill has a touch of caramel with gas station pecans and stale dried fruits. Most of the bottle was poured out. At least it didn't smell like vomit. I am trying to find something nice to say about this beer; wait I found something. It is union made. I have never been a fan of non-alcoholic beer. Perhaps it is because the brands offered are bland and tasteless. This issue of the journal Medicine and Science in Sports and Medicine demonstrates that low alcohol beer can be healthy for you. Researchers at the University of Munich (where else) gave low alcohol beer to marathon runners. Subjects consumed between 1 to 1.5L of low alcohol beer for three weeks before and two weeks after the Munich Marathon. The beer used in this study was alcohol-free Erdinger Weissbier. What the researchers found was that runners given beer had a 3 fold reduction in the incidence of upper respiratory tract illnesses (URTI) after the marathon. They also had lower blood levels of interleukin-6 (IL-6) and high-sensitive c-reactive protein (hs-CRP); both are blood markers for inflammation in the body. This is a big deal for high intensity athletes. These athletes are known for URTI and inflammation due to the physiologic stress associated with prolonged exercise. So how did beer help? Beer is a major source of phenolic compounds in the diet. Plant based phenolics possess anti-viral, anti-oxidant and anti-inflammatory properties. Remember beer is an extract of plant based materials (barley and hops). Other notable sources of plant based phenolic are green tea and the immune boosting botanical Echinacea. It is thought that products with multiple phenolic compounds work better that individual ones. More than 50 polyphenolic compounds have been identified in barley and hops. Everyone knows how I feel about flavoured porters. One cannot simply resist a fancy bottle with the word 'double' by Rogue. I'm not sure what to believe about the labour relations accusations circulating about Rogue. Hopefully there will be more news about this topic. Regardless, they make great beer. An understated nose escapes the glass; not what you would expect from a 'double'. The taste speaks of double. Big flavours of roasted coffee beans up front yield to bittersweet chocolate, slight vanilla and hidden dark fruits. As the Rogue warms up, more vanilla aromas appear. Through it all there is a massive nose and taste of citrus hops; not surprising for a 78 IBU beverage. A good dose of astringency carried the long linger of roasted bitter goodness.